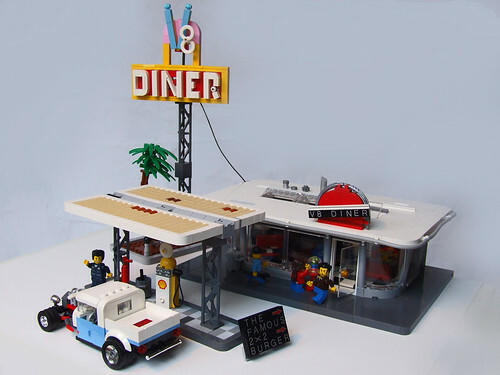 Brick Town Talk: Gas and Grub - LEGO Town, Architecture, Building Tips, Inspiration Ideas, and more! Route 66 - (BTT) There is a certain appeal to the 1950's that seems to be more universal than any other era. The hot rods, the poodle skirts, the rock and roll - all things easy to romanticize about while still being sufficiently modern enough to seem relatable today. After all, if you are going to transport yourself somewhere in the past, you might as well pick a time that had flush toilets and televisions, even if they weren't as thin as colorful as you are accustomed to now. Pull up a seat at the counter of the V8 Diner and get yourself a burger and a malt, and enjoy being able to fill your tank at the neighboring gas station for less than the price of your typical Starbucks latte.